Putnam General Hospital: Dining Room. The Caf� at Putnam General is open for Breakfast, Lunch, and Dinner offering a wide variety of foods for your dining pleasure. Our menu features a Heart Healthy selection each day, along with two main entrees and side items. 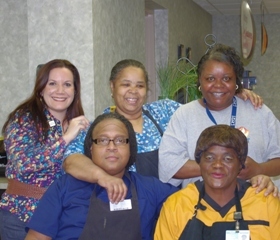 With reasonable prices, the Caf� at Putnam General is one of the best places to eat in Eatonton! Breakfast- 8:00 a.m. to 9:30 a.m.
Lunch- Noon to 1:30 p.m.
Dinner- 4:00 p.m. to 5:30 p.m.